India - a Tourists paradise: Speaking Tree - Why I don't follow Vivekananda anymore? Speaking Tree - Why I don't follow Vivekananda anymore? 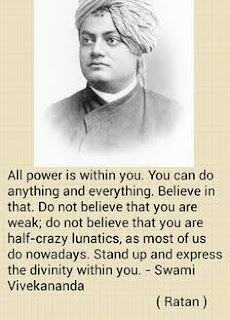 I first picked up the teachings of Vivekananda when i was just out of Class X, some 27 years back. And i first wrote something in this column -- on the man who i by then described as my philosophical guru -- in 2004, 12 years ago. Over the years, increasingly, I have thought about his works, spoken about them, written about them. But something's been changing. The recurrent need to explain something entirely in his words has diminished. The frequency with which I have to flip open the pages of my old, well-worn and underlined books on and by Vivekananda has been quietly reducing. The sense of panic when they get briefly misplaced isn't as high. For something i wrote about Vivekananda recently, the learned gentleman reading the draft took a deep breath and said to me, "You know, don't get me wrong, but there's more of what you think here than of what he says". That was when i got some sense of why that charge was coming my way. Once i understood and absorbed Vivekananda -- absorbed till the point i didn't need to pick up the books to quote him, didn't see many of his thoughts just as thoughts but as experiments i'd done with my life, things i'd lived out -- my reflexes imperceptibly changed. Contradictory as it may appear, the more i followed him, the more the idea of "following" itself began to seem pedestrian. Over time, by absorbing what he was saying, i learnt to not believe in indisputable truths but instead to believe in doubt; to consistently question, to ask, to wonder; to not be God-fearing but to fear the idea of being afraid; to realise that any entity that i fear is an entity that diminishes me. From the man who wore saffron i learnt not to leave the interpretation of my life's rights and wrongs to those who wear saffron -- or any other shade of righteousness. And so, i realised that the less i blindly hero-worshipped Vivekananda, the greater was his success as my hero, as my teacher. After all, the victory of a teacher at school lies not in our need to refer all questions back to him, but in our increasing need to not do that since he has enabled us to master the subject. Why then, should the victory of a philosophy lie in the need of the follower to keep following, instead of mastering the thought itself? The Little Leader needs that every word of his be unquestionably worshipped. The evolved mind of a Master looks to go beyond that, as Krishna did at the end of the Gita -- it looks to talk to you as an equal and then leaves the final call to you. I have for long been enthralled by this dramatic, flamboyant thing that Vivekananda said: "The older i grow, the more everything seems to me to lie in manliness. This is my new gospel. Do even evil like a man. Be wicked, if you must, on a grand scale!" The older i grow, the more everything about following Vivekananda seems to me to lie in understanding the core of his life, not in being a clerical follower of his writings. I have begun to think that to truly follow Vivekananda is to lose the reflex of ‘following’ itself. This is my new gospel.